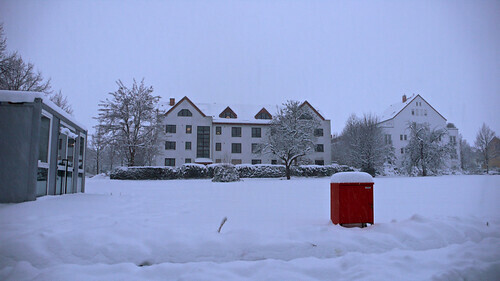 “Thousands of travellers have had their plans disrupted by further snowfalls across Western Europe.” BBC News. The plan was to visit the Christmas Market at Bad Homburg. In this weather did that make sense? Should we propose to go to a cafe instead? Near Frankfurt airport, in a stretch that crosses the path of flights near their landing strips, we saw a large Lufthansa jet emerge suddenly from the mist. This unexpected vision, so close to us, left us stunned – for a few moments it took our minds away from the snow. But not for long. As we left the A5 and joined a smaller road the countryside came into view: a white blanket. The only contrast was a line of bare trees reduced to their trunks; the branches, now white, had merged with everything else. Bad Homburg was under a feet of snow. Parking in the open spots was impossible, so we left the car on the street. L and U were glad we came despite the weather. From their second-floor apartment the view framed by the window seemed like a postcard. “It’s like a ski-resort, isn’t it? !” U said. I casually asked if the Christmas Market would be “open” in such conditions, adding, with a hint of expectation, that we could perhaps go to a cafe instead. But my hopes of sitting cosily in a warm cafe were short-lived: L was confident it would be fine to visit the Christmas Market even under heavy snowfall, and soon plans were made to go there. We would all go in one car, theirs; our car would be parked in their closed garage. A narrow one-way ramp – open, and full of snow – led down to the garage in the basement. Wife wondered if we would have difficulty going up the ramp on our way back, but I waved it aside. It wasn’t a smart thing to do, not because we would, as she feared, get stuck, but because when the wife suggests something, it is wise to follow. Ten years of marriage teaches you this: there’s her way, and the wrong way. 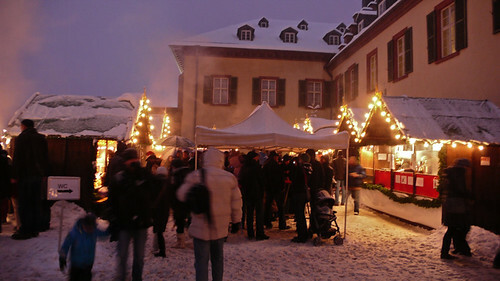 The Christmas Market, setup inside the Bad Homburg castle, was crowded. Weather seemed to matter little; everyone was at ease and well equipped, with snow boots, furry caps and hats, umbrellas, and even sledges. A strong smell of fish hit us from a stall near the entrance. 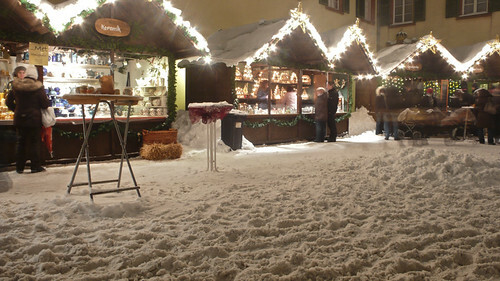 Other stalls were more conventional – crepes, gluh-wine, roasted nuts, honey. We found an empty table under a tent and stood around it, huddled. Someone suggested drinks; L and I walked over to one of the gluh-wine stalls. It was a busy place. Above the many heads in front I could see people behind the counters moving briskly from one order to next. Efficiency is so much a part of this culture that it makes me wonder if there is a gene behind this quality. When our turn came, the heavyset brunette who took our order came back with two cups of gluh-wine and two cups of hot chocolate. “Dreizehn Euro bitte, mit pfand!” she announced. The pfand, an amount you deposit until you return their crockery, is surely a superfluous concept: the conscientious Germans return others things, no matter what. Back at the tent a man was trying to remove snow on the roof. “Vorsicht!” he would shout at passers by, and punch the sagging roof a couple of times before moving to another side and repeating the routine. T he hot drinks brought colour back into our cheeks. The women went scouting for food, L and I spoke about his new job, and little J, only 3, nibbled at her sausage. Nearby, at the toy train station, children sat on boxes that were compartments linked to a tiny but authentic-looking steam engine. The whistle blew, steam escaped the engine, the train began to move, the kids held on to whatever was near, the parents cheered and waved. Snow continued to fall. An hour or so later my toes, already cold, began to grow numb. We decided to return. People were still coming in; it was the last weekend of the Market, U explained. We drove back slowly to their apartment, through streets full of snow and also full of life. Inside their garage, after a few Goodbyes and Thank-Yous, we got into our car. L opened the garage door and I started up the ramp. The second gear was a better choice, but did not take me much further. I backed up and tried again – no luck. We reached the half way mark. “How about shoveling the ramp?” I suggested. I sat in the car, thinking. If we couldn’t get out we’d have to stay here overnight, and hope someone cleared the ramp early next day. We would sleep in our clothes and there would be no toothbrush in the morning. Some meetings at work may have to be canceled. Minor annoyances. Thankfully we aren’t stuck in the middle of the highway. Still, it would be good to get out of this fix and be on our way. Shoveling snow from the ramp under a steady snowfall took half an hour. Ice covering the wheel tracks was loosened, snow was brushed away. When L was satisfied, he got into the back seat. I switched to second gear. This really was our last chance, and it had go all the way up – partial success was of no use. It must have lasted about 10 seconds, but seemed longer. When the car stopped we were on flat ground, out of the ramp. The relief was palpable. On the drive back Wife sent another SMS: We are on A5 at Frankfurt. Looks better. U replied: Good to know, good luck! Back home, we turned up the heaters and switched on the TV. The BBC had images of snow-wrought chaos across Europe. We now knew what that meant; we had our own story to tell. Merry Christmas! I’m so glad you made it there and back safely — and with a good story to tell! We are pondering a similar decision about travel tomorrow in the northeastern U.S….so stay tuned!